In 1967, Ralph Cindrich left Avella, a coal-mining town in Western Pennsylvania, traveling northeast on state route 50 to Pittsburgh to play linebacker for the Pitt Panthers. 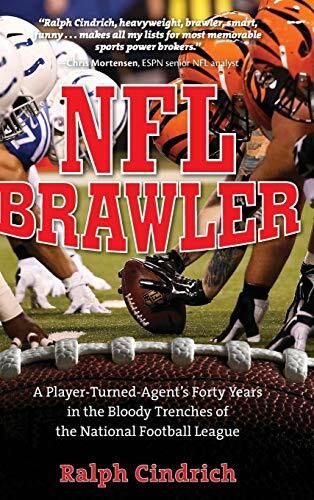 His new book, NFL Brawler: A Player-Turned-Agent's Forty Years in the Bloody Trenches of the National Football League, shows that he never really left Avella. With a blue-collar hard edge, a “chip on his shoulder pads,” and a natural ability to serve his underappreciated pro athlete clients, Cindrich succeeded in the only game with more broken psyches than football: the world of sports agency. At the negotiating table, Cindrich also obtained redress for the battered roughness and self-doubt of his childhood. Legendary coach Vince Lombardi once called agents “flashy sharks with sunglasses and diamond rings looking for money they didn’t earn and don’t deserve.” Many unscrupulous agents deserved such disdain, lacking training, experience, and ethics. Other agents, like Scott Boras and Tom Condon, counterbalance these miscreants. Ralph Cindrich fits into this secondary category of exemplary player representatives. Cindrich’s self-congratulatory memoir is designed to thrill sports fans who can live vicariously through his endless triumphs over less able club managers and owners. There is only one star on the field: the author himself. Cindrich was a marginal player for four years in the NFL, a playground of mindless violence where job security is always tenuous. When the end of his athletic career was in sight, Cindrich attended law school at night. Cindrich’s career as a practicing lawyer was as insignificant as his playing career until he found his niche: combining his innate skills as a negotiator with his personal experiences as an NFL player. His brief career in the game gave him instant credibility with potential clients. He was single-minded when it came to his commitment to the lunch-bucket offensive and defensive linemen he represented. They were “Avella-types” like him—underappreciated and underpaid. Cindrich would change that. Cindrich regales his readers with more than 20 stories of the men he represented; however, the stories do tend to be repetitive. He enjoyed the contests with NFL owners and general managers, many of whom might have thought Cindrich insane and most of whom he characterized as “tight-fisted.” Cindrich used all his assets, including his access to the press and his personal courage and toughness borne on the barren football fields of Western Pennsylvania and the wrestling mats of Avella High School. Throughout his book, Cindrich sprinkles in the crude language of the locker room and the boardroom. Perhaps that is necessary in order to prove the verity of his text, but at times it seems gratuitous. Even men like Bill Polian, an executive with the Buffalo Bills and other clubs, a “worthy adversary” now in the NFL Hall of Fame, exchanged earthy pleasantries with Cindrich. Others on management side, like Bob Irsay and Jimmy Johnson, do not fare as well in Cindrich’s estimation. A sports agent’s only real asset is his reputation. Cindrich took care to be known to both management and the players as a straight shooter who would fight hard for the players’ interests. His word was his deed, and when a club would renege on an oral arrangement, Cindrich would not forget. The advent of free agency offered Cindirch the opportunity to create new strategies to bring his clients riches for the few years they were active in the game, but he would not get piggish: “You need a plan. You always need a plan.” And Cindrich would invent them as needed. Cindrich expresses nostalgia for the way the game used to be played, before we finally recognized the devastating effect of player injuries. When your “bell was rung” on the field, you headed back to the fray and not to the medical specialist on the sidelines. The average NFL player, however, loses three years in his lifespan for every year he plays in the league. Cindrich, however, loved “seeing the stars after a huge hit.” Perhaps it will take another generation of player agents before there is a force in the marketplace whose goal is to reform America’s favorite and most vicious sport. Roger I. Abrams’s most recent of six books on the business and history of sports is Playing Tough: The World of Sports and Politics. He is a leading authority on sports and labor law and legal education, has served as a salary arbitrator for major league baseball as well as in other realms, and is Richardson Professor of Law at Northeastern University.